Story: What inspired the work? 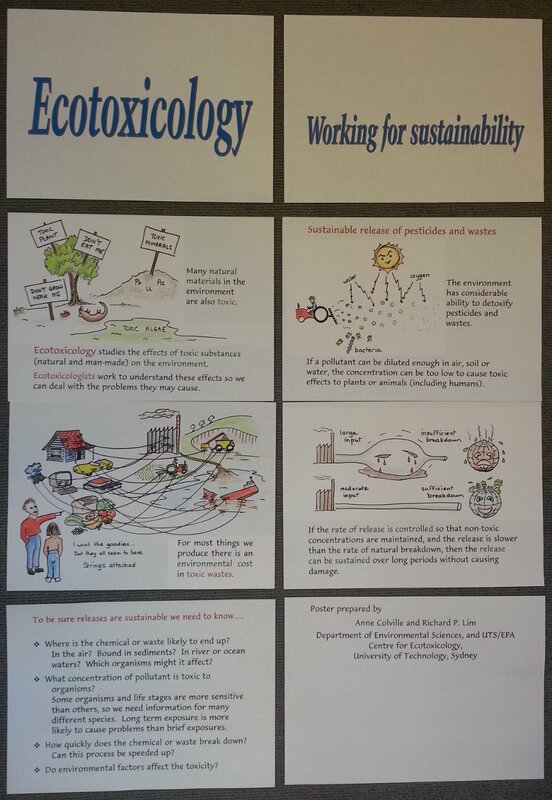 UTS was organising a Sustainability Expo in October 1998, and I decided to prepare a poster that talked about our work in ecotoxicology. I wanted to explain that our lifestyle inevitably produced toxic pollutants, but that there are also many naturally toxic substances too. However, these pollutants can be managed sustainably if the output is limited to what the environment can degrade. Ecotoxicology studies the properties of these natural and man-made toxic substances, and provides vital knowledge required to sustain a healthy environment. Method: How was it developed (what methods, processes)? I decided to use cartoon-style drawings to illustrate the main ideas, to give the poster a lighter feel than pages of solid text would do. At the time we didn't have access to large-format printing, so the drawings were roughed out in soft pencil and redrawn with coloured pens. The text was set up as a Word file and printed, leaving spaces for insertion of the figures. Acknowledgements: Who supported the work, financially and in kind? Literature: What people, papers, books, exhibitions, or other things inspired it? The poster was inspired by a wish to showcase Ecotoxicology and its importance to our lifestyle. The drawings combine aspects of cartoons with people talking in thought-bubbles, and diagrams from biological textbooks. I hope the poster will give some knowledge of where pollutants come from, and what sorts of things we can do to understand and manage them. I have always been interested in Science. I did two degrees in Zoology, and then worked in hospital pathology labs and university biochemistry labs, and taught in TAFE for many years. In the 1990s I "discovered" ecotoxicology, and after another Masters and a PhD, I'm still fascinated by it. The poster was presented at UTS Sustainability Expo: 13 October 1998. A version with the same text and figures redrawn was displayed at ScienceFest on 4-5 May 1999.